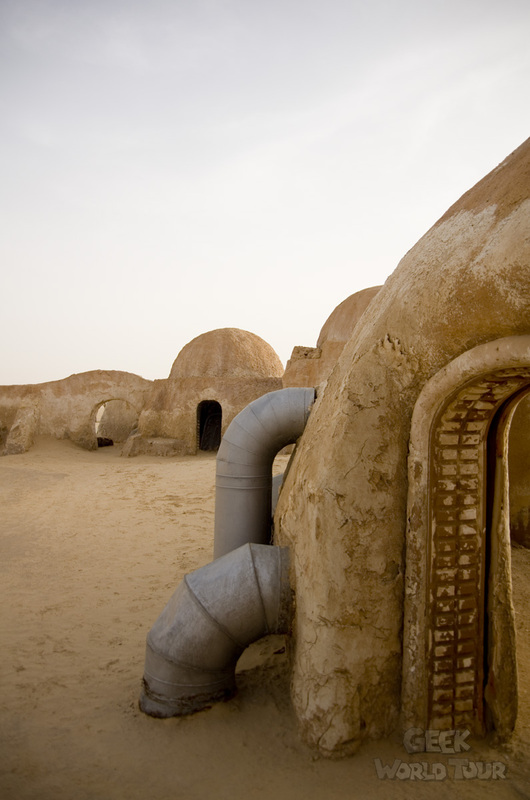 And if you were to go to Tatooine ? 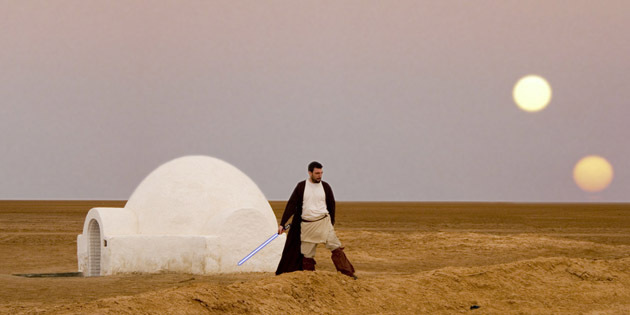 Star Wars fans: you loved the 1st trilogy. Wait… no… The 2nd… No, that’s not right… The original 3… Okay, so, let’s specify Episodes IV, V and VI. 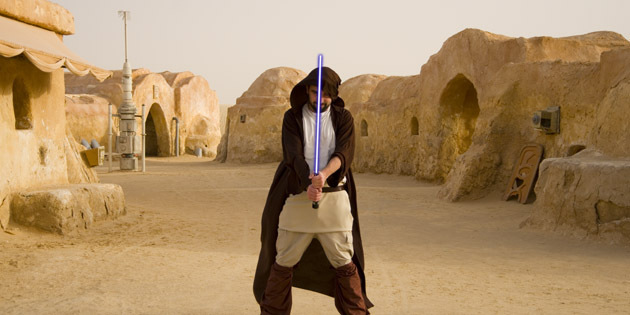 I repeat, you’re an absolute fan of Star Wars. You’ve watched and rewatched, you’ve spent your childhood nights dreaming of visiting distant galaxies… Now that you’ve grown up, you can build your own Millenium Falcon! 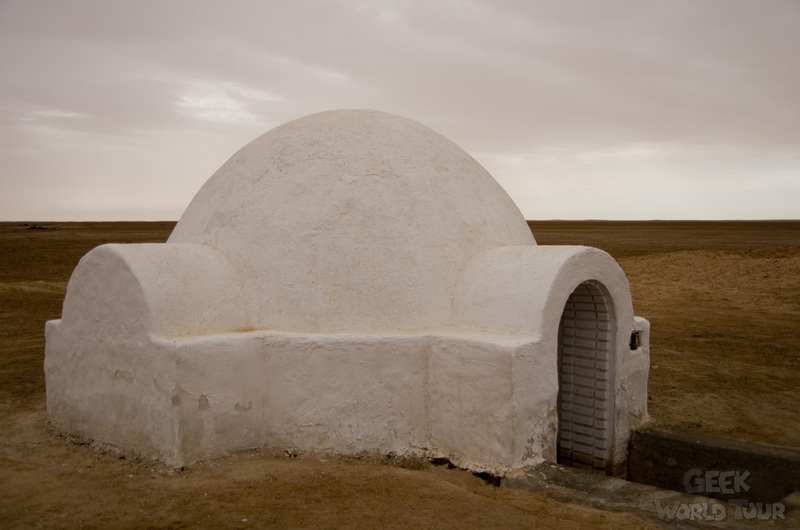 Or… more simply (and cheaply), you can visit the set of Tatooine in Tunisia! 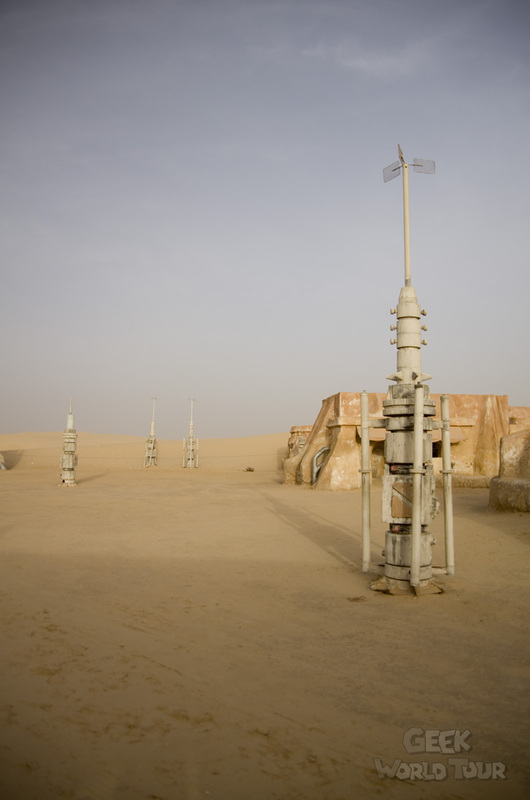 There are several places, especially around Tataouine (the city that gave its name to the world of – almost – the same name), but I’ll talk now specifically about Nefta, a small town not far from Tozeur. 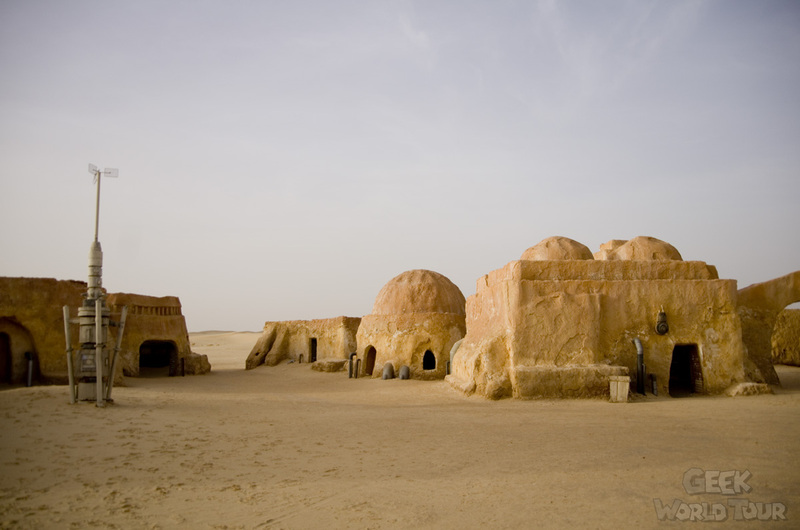 Just 13km (8mi) northwest of Nefta, in the desert of Oung-Jmel, lies the city of Mos Espa on Tatooine. 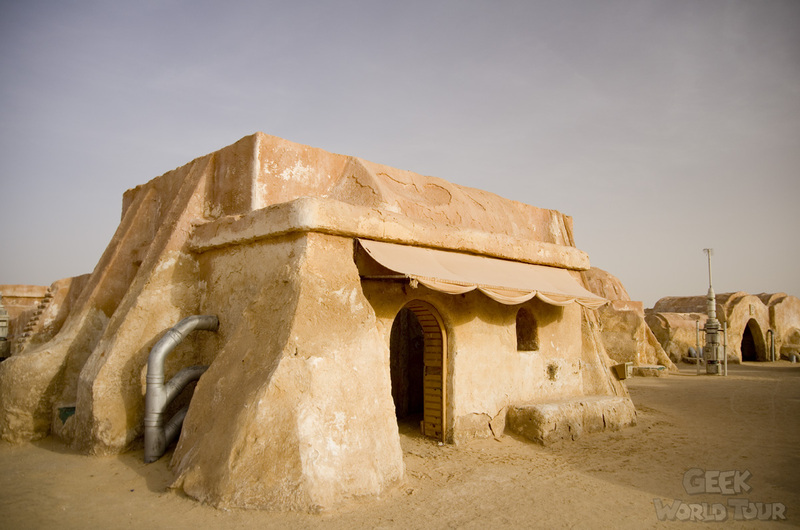 This is the city which was home to the young Anakin Skywalker, a slave who worked for the second-hand store owner Watto. 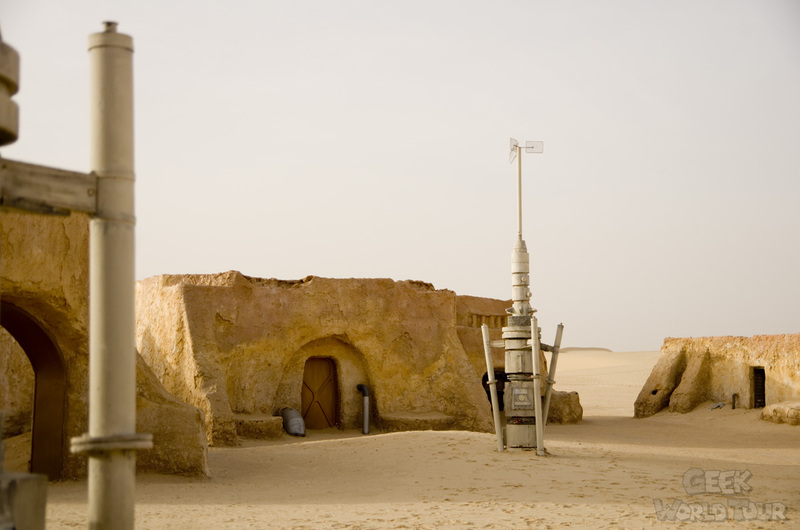 The set was used again during the filming of Episode II, though it was originally built for Episode I in 1998. 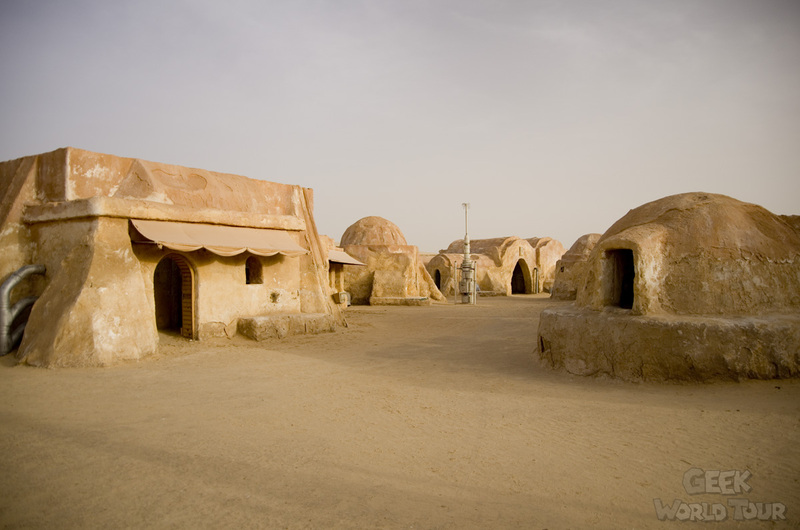 The set consists of 2 streets, a square, and many buildings, which are all well-preserved despite no maintenance being done. 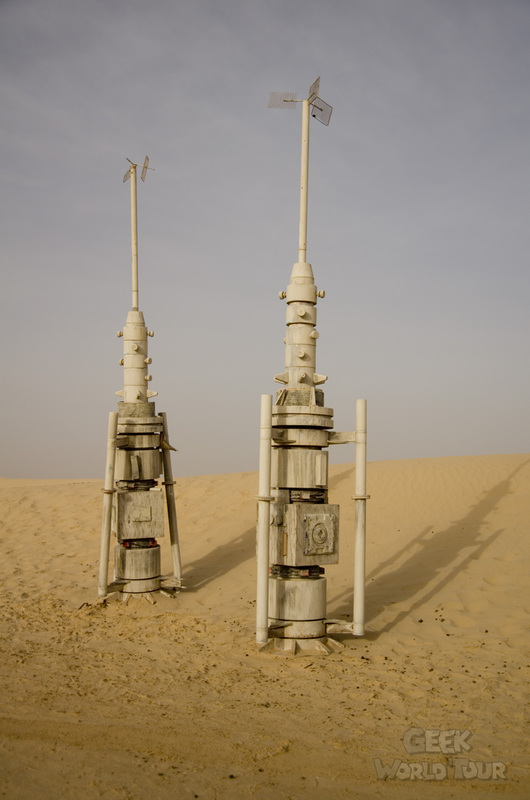 I don’t expect it will last very long… Some mist sprays are, unfortunately, visible on moisture vaporators. Is it still worth the effort? For a chance to see behind the scenes? As incredible as it seems, the sets are made only of cardboard. 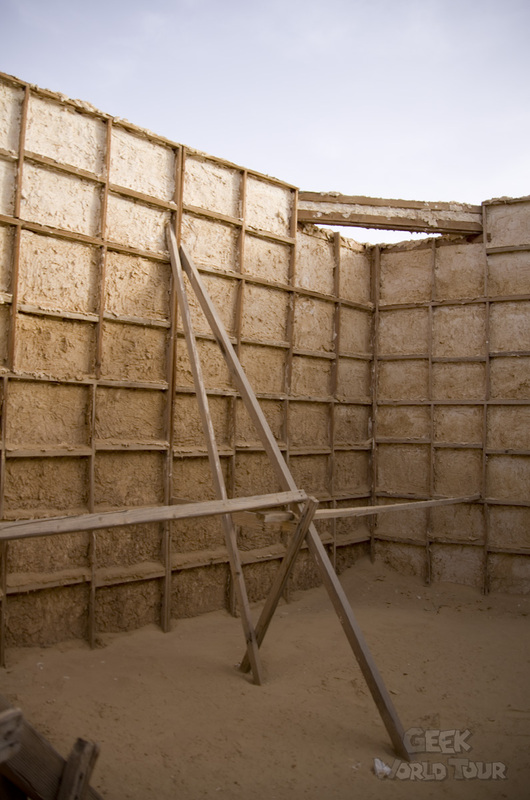 A wooden frame, grilled a bit, coated with earth; that’s what the set of the most profitable film series in the history of cinema is made of. 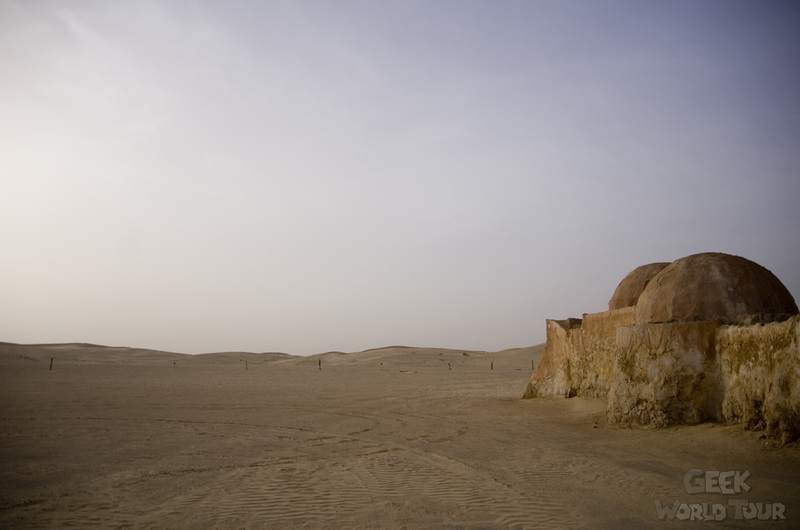 I visited Mos Espa in January 2013, a fairly quiet period where tourism is concerned. 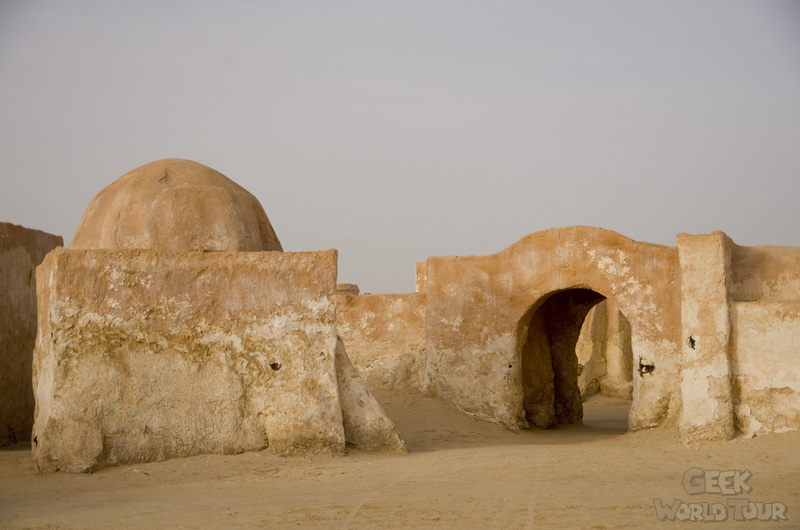 I can not say what the place looks like in July or August, but during the off-season, you can easily take pictures of the whole scene, possibly with you in the middle posing as a Jedi (but that would be a crazy idea…) without a single tourist or merchant to spoil it. 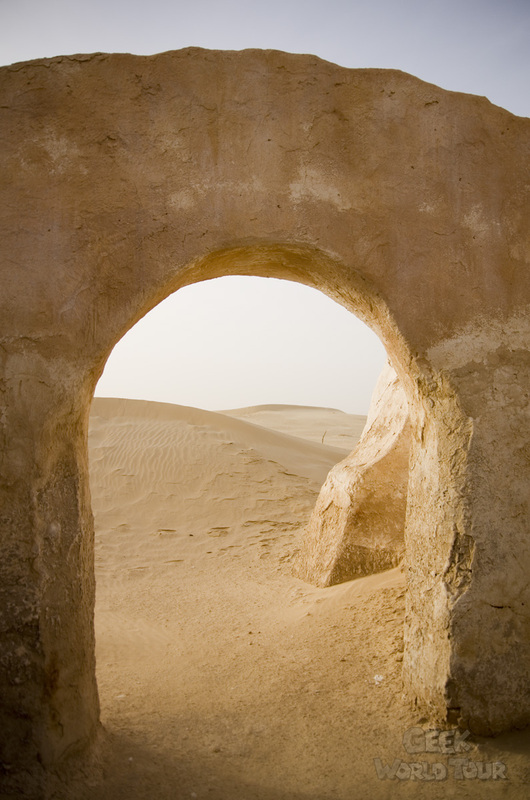 You can get there by tourist car, as there is a road that passes very close, or you can take a trip with a 4×4 in the dunes before arriving on set. 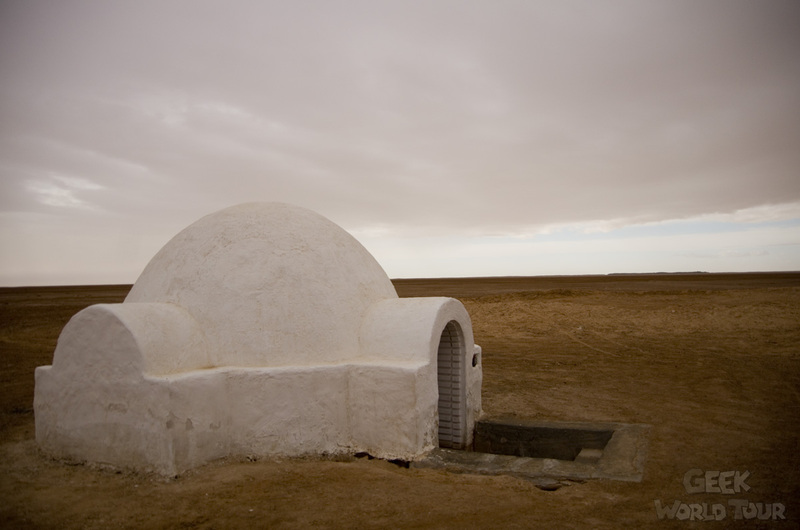 10km (6mi) west of Nefta, in the Chott el-Jerid, a salt desert, stands a white dot in the middle of nowhere: the Owen Lars’ homestead. This “igloo” should be recognizable by even non-fans. 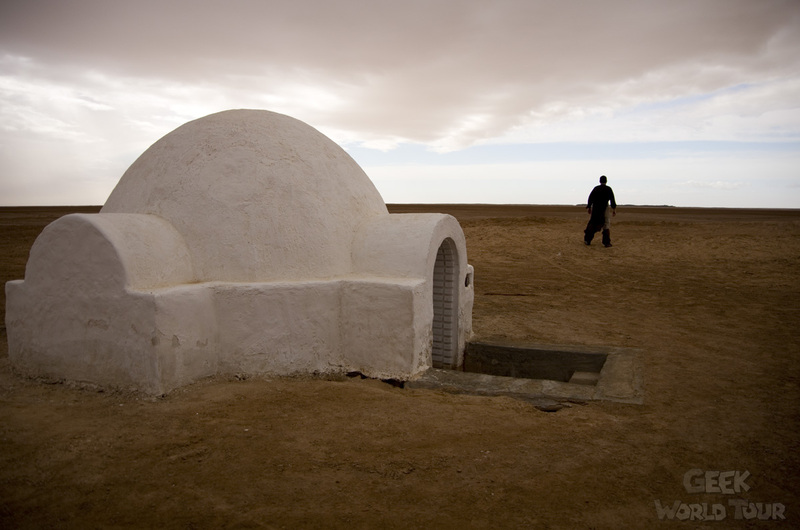 Seen in Episode IV, this was the childhood home of Luke Skywalker and R2D2 before they left the desert with Obi Wan Kenobi. 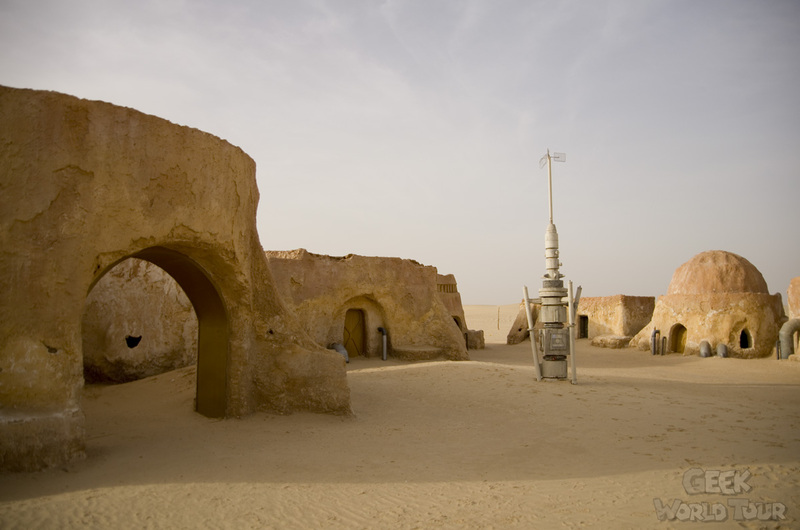 This scenery had been built in 1976, but suffered greatly due to harsh weather conditions and had to be rebuilt for the filming of Episode II in 2002. 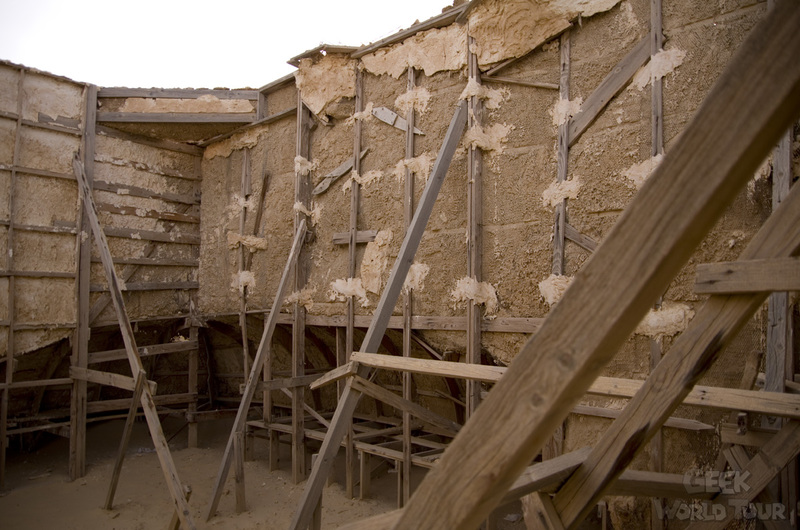 Now, more than 10 years later, it has suffered again from wind storms which whip salt at its structure. So how, then, is it still such a brilliant shade of pure white? 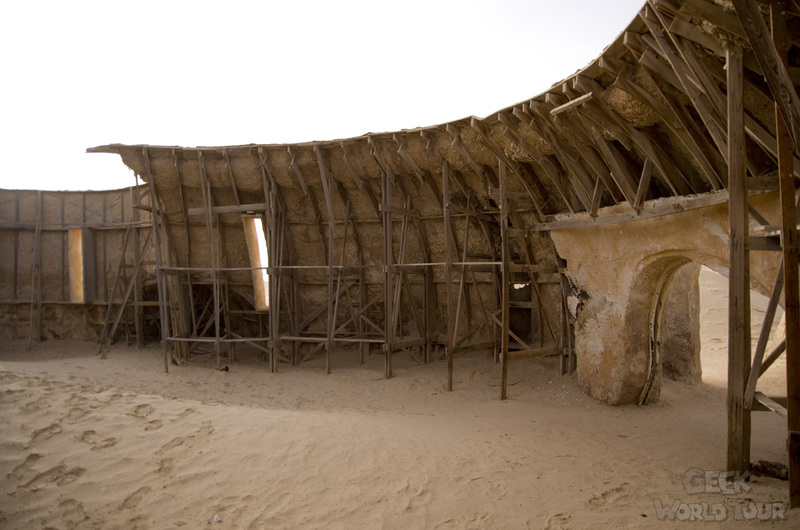 Because of its poor condition, petitions circulated on the internet to ask the Tunisian government to maintain it. 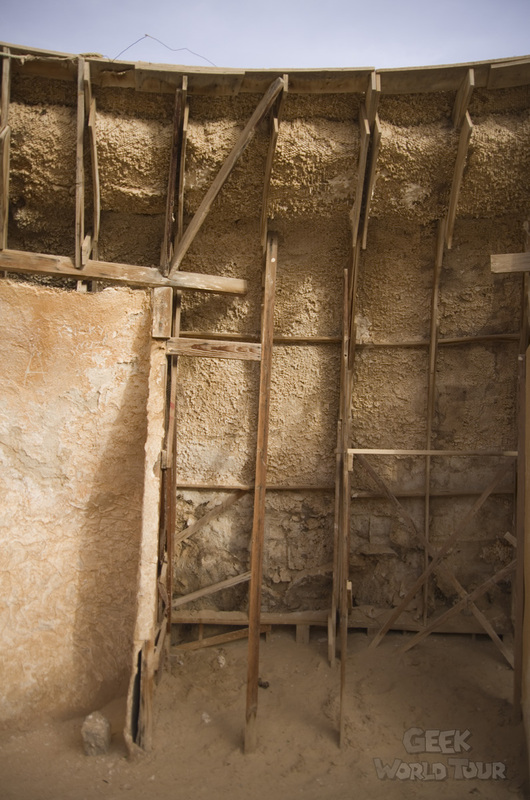 As nothing was done, a group of dedicated fans decided to renovate it themselves in May of 2012. Where to establish one’s base camp? I’m not too sure, but it should work, especially if you show them pictures of Dar Hi Nefta. This is the hotel that hosted me during my stay in Tunisia and, objectively, it’s a feast for the eyes. 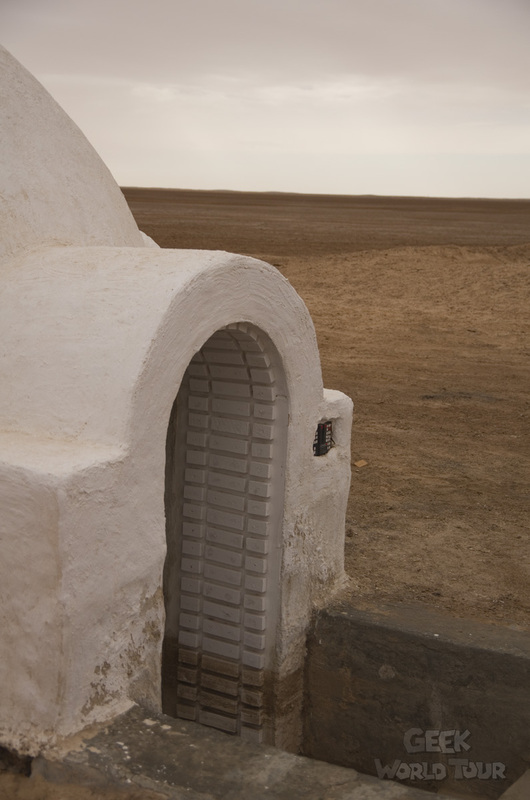 Whether it be the hotel itself or the desert, or simply for a taste of simple relaxation. Ever your devoted servant, I tested the massage for you… a moment of pure pleasure! 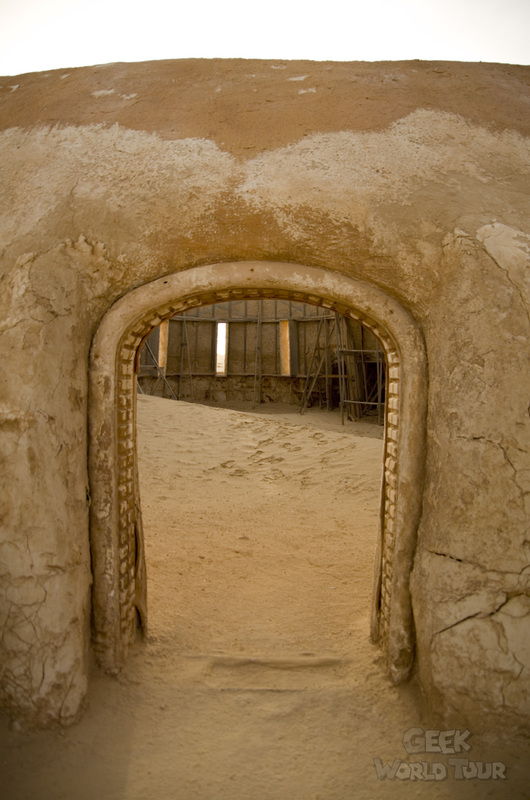 You can find more information and photographs on the hotel website. Thanks to Frédérique and Laurence for their trust and to Christian for his place.